Diarrheal diseases (DD) are an important cause of disease burden, especially in children in low-income settings. DD can also impact children’s potential livelihood through growth faltering, cognitive impairment, and other sequelae. 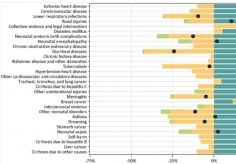 As part of the Global Burden of Disease study, we estimated DD burden, and the burden attributable to specific risk factors and etiologies, in the Eastern Mediterranean Region (EMR) between 1990 and 2015. We calculated disability-adjusted life-years (DALYs) – the sum of years of life lost and years lived with disability – for both sexes and all ages. We estimate that over 103,692 diarrhea deaths occurred in the EMR in 2015 (95% uncertainty interval: 87,018–124,692), and the mortality rate was 16.0 deaths per 100,000 persons (95% UI: 13.4–19.2).The majority of these deaths occurred in children under 5 (63.3%) (65,670 deaths, 95% UI: 53,640–79,486). DALYs per 100,000 ranged from 304 (95% UI 228–400) in Kuwait to 38,900 (95% UI 25,900–54,300) in Somalia. Our findings will guide evidence-based health policy decisions for interventions to achieve the ultimate goal of reducing the DD burden.